Today (and this entire weekend) my family and I have honored and remembered those who have made the ultimate sacrifice for this country in order to keep us free. This weekend is not about BBQ's or welcoming summer to us, its about the men and women who served in our nations military, and who will never be coming home. I'll be leaving the house in a bit to accompany my friend to Anchorage for a Memorial Day ceremony. My friend is a Gold Star Mom, which means she lost a child to war. He was killed Jan. 7, 2006 in a helicopter crash in Iraq and he is one of the young men being remembered at today's ceremony.. This day is for him, and for all the other fallen heroes. Thank you, and we will never forget. Yesterday we attended the ceremony at the Alaska Veterans Memorial at Byers Lake with the same friend I'm going to Anchorage with today. 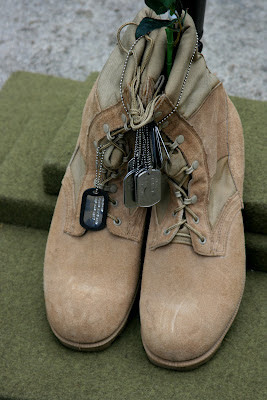 The dog tags on these boots are from fallen Alaska warriors. Her son's dog tags are on these boots. Great post! Thanks and God bless all of those past and present for serving in our military. Please tell your friend thank you - from those of us who value our freedom and her sacrifice.